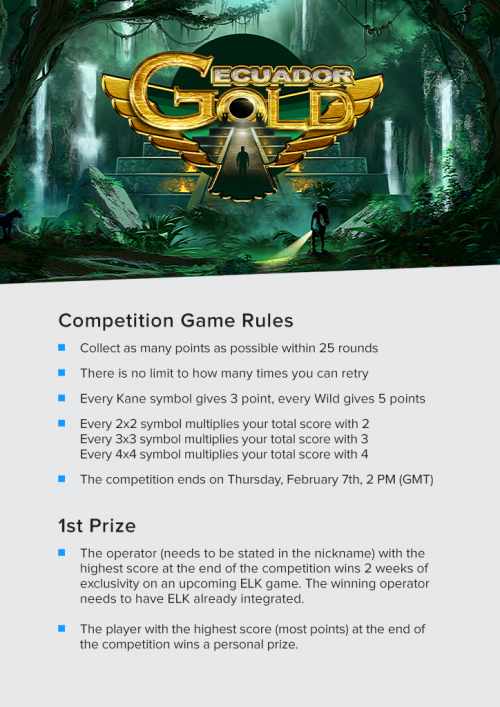 Starting Tuesday February 5th at 11:00 AM CET, we will host an ELK Compete operator exclusive tournament with our next release Ecuador Gold. Set up with unlimited re-tries, all operators will be able to compete for an exclusive launch for one of our upcoming games during 2019. To compete, go to elk.run and make sure to visit our stand at ICE, you will find us at N4-345! A new leader starts the day in our competition. Betsson is in the lead. ELK Studios are happy to announce that we are exhibiting at the ICE Totally Gaming event in London February 5-7th! We would love to meet you at our stand to show our latest products, share our upcoming news or just to have a quick chat. We look forward seeing you at stand N4-345!